Reapportionment is a messy business. As a military veteran who served 12 years, a lawyer who has practiced 13 years, and an elected official for a year, I'm familiar with battle lines, strategy and targeting. Yet, I have rarely been as stunned by naked ambition as I was when I visited the state Reapportionment Office in July. That day, I learned that I had no legislative map to view because they claimed not to know my home address. The claim was patently ridiculous. After all, my address had been turned in numerous times, is on the Georgia House of Representatives' own website and could have been provided with a single call. But that was just the beginning. When confronted, they plugged my address in and a map appeared. My residence anchored the extreme end of a district that resembled a long snake stretching from the Northlake area of DeKalb County into south DeKalb near Covington Highway. My previously compact district with identifiable communities of interest had evaporated, taking with it multiracial coalitions that have thrived. It wasn't that they hadn't drawn me a district; it was that they hadn't drawn my constituents one. One salient fact explained the absurd lines. At the other end of this gerrymandered district lived a long-time African-American incumbent legislator. I had become one of a number of white members of the Democratic caucus drawn into predominantly black districts — part of the 2011 Republican purge of white Democrats from the General Assembly. When asked why this awkward district had been drawn, my colleagues and I were told it was "necessary" and the Voting Rights Act made them do it. In written protest, I told the Reapportionment Office that their actions were unconstitutional. A few days later, my "necessary" pairing with an African-American legislator disappeared. Instead, the committee produced a new map. Like the first, it showed no respect for communities of interest, but it clearly revealed the intention of the Reapportionment Committee. 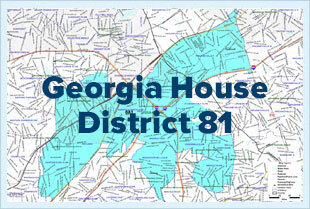 The new map put Rep. Elena Parent, another white Democratic incumbent, into the same district. But remarkably, the district was engineered to favor GOP candidates by, among other things, splitting precincts. With the new map of the 81st District, Republicans are hopeful they can purge two white Democrats from the General Assembly — one during the primary, and the other in the general election. The second map is as unlawful as the first. The Republicans are determined to manipulate the map so as to control the racial makeup of the General Assembly. But they are not doing this, as the Voting Rights Act requires, to ensure that minority voters have a fair voice in government. They are doing exactly the opposite. They have engineered political boundaries based on race to resegregate Georgia for the political advantage of the Republican Party. Simply stated, the map produces majority white districts to elect Republicans and majority black districts to elect Democrats. If approved, this will guarantee that minority voters will practically be barred from wielding any political power within our state government and would have the effect of eviscerating the Voting Rights Act. Democrats were the bad actors once and were rightly slapped down by courts. Republicans cannot hide behind a false interpretation of laws that protect our civil rights to dismantle those rights for voters. Georgians deserve a process that does what independent, alternative maps prove can be done — preserve communities of interest and reflect the political power of those in charge, but never wield that power against the citizens it is designed to protect, or use race as a bludgeon.